She explicitly said she wants to limit that one industry. I understand that you said both should be restricted, but I can’t get anyone to acknowledge her desire to limit only specific types of speech she doesn’t like. That seems very antithetical to the first amendment. Do you not agree? I agree, but I am not sure it is fair to extrapolate from one example given in discussion to a general principle. I thought about how to phrase my response to make the point that I was not trying to ban points of view I disagree with. I think it is fairly harsh to attribute such nefariousness to anyone. here’s a good example of her arrogance on display. instead of supporting her case with sensible details and facts (which she has none of) she just blurts out “i’m the boss” again essentially. you can see her queen complex pretty clearly here. “after we’re elected we do what we want. not what electors want”. just like many democrats. Help me out here. I am trying to find the specific AOC quote in its context. All I can find is someone telling her to be in the cheap seats and her twitter response that people who can only afford the cheap seats still deserve a voice. I am wondering what the interaction was that leads to this conclusion about AOC. Her comment on being consigned to the cheap seats seems reasonable to me. What a ridiculous post. You should be able to do better than that. Palin can match Cortez quote for quote in gaffes and you know it, if not far exceed her. And every time she came out with a whopper the Libs would poke fun at her and the Cons here would retort, EVERY TIME, that we were simply frightened of her. I make the same argument here, and I think its a reasonable one. i am not talking about the “libs here” per your point i mostly agree. for instance, why hasnt anyone cornered AOC on various supreme court case questions yet? when she is unsure of herself or stumbles why no stern over the glasses admonisment a la Charlie gibson? Someone who was running to sit one step away from a President who was known to have heart problems should be subjected to closer scrutiny than a first term Congressperson from New York City doncha think? The only reason Ocasio-Cortez is getting all this publicity is because the CEC decided she looked like a punching dummy only to learn she would punch back. She should get as much coverage as stupid Congresspeople like Louis Gohmert – who gets a lot of play on progressive sites for his idiocy – but never gets called out by the mainstream media. Another reasonable comparison would be the coverage of Palin as Governor of Alaska. The Vice President is an entirely different ballgame. 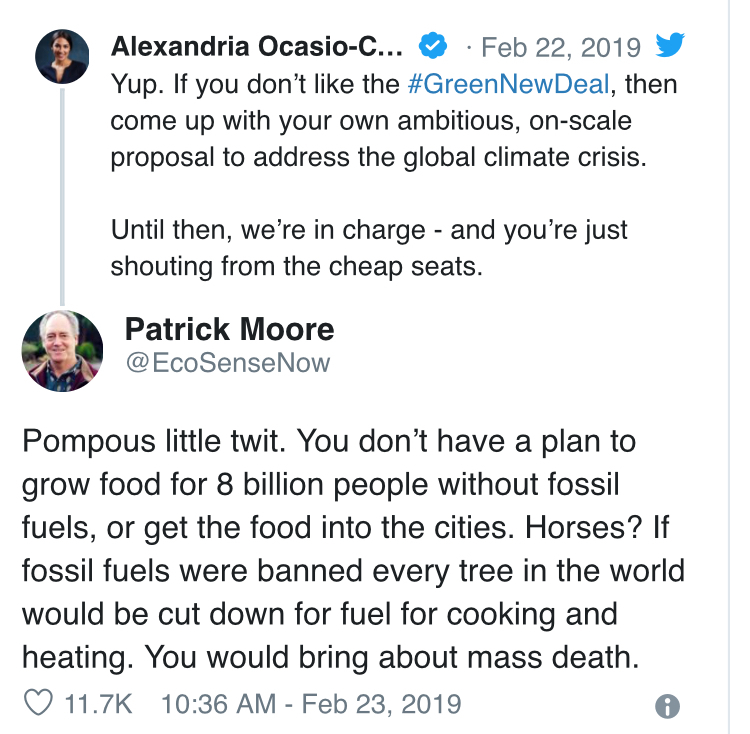 I just found AOC’s Twitter comment. You are right, that was a cheap shot. Definitely a gaffe. What’s the appropriate response? Censure? Impeachment? Defenestration? If anyone thought it important to prove that AOC is not perfect, you’ve proven that point. Oh no. Trust me. Palin is light years dumber than AOC is. The media didn’t have to “try” to do anything with Palin. Her word salads and streams of consciousness made her look dumb all on their own. Because she’s not running to be VP of the US right now? And “stern over the glasses admonishment?” Oh please, Palin was no victim as the right-wing tried to paint her during that time. She was a virtually unknown politician from Alaska on the R ticket to be VP, whose rise to fame included being a small town mayor and a short-term governor. AOC is a House representative. Not running for national office right now. So it shouldn’t need to be explained why the two haven’t faced the same media rounds. The difference shouldn’t need to be explained. Can you name any of the other freshman senators in the new House? Because they got elected, showed up to be sworn in and are in the process of learning the job. AOC is a ■■■■■■■ know-it-all who hasn’t shut up since she was elected. That’s not obsession, it’s observation. I don’t believe any of us can name a freshman senator in the new House. Any of us. But that’s exactly what she wants to do, according to her campaign website which is from where I took that quote. Expand the gun control / assault weapons ban section. It’s the 7th or 8th paragraph in that section. You know, for someone who loves the 2nd amendment so much. Alexandria Ocasio-Cortez, the first great Revolutionary after the death of Fidel Castro. Viva La Loca! Que Viva! If I remember right they took a plea deal to a not very significant charge because the prosecution was pretty incompetent. They bungled the evidence pretty badly, in fact I think they lost basically all the physical evidence. Anyway, the people who claim she laughed about getting him off almost certainly never listened to the interview. You are right about lobbying and I don’t agree. Issue specific bans are slippery slope to be avoided. I would like to see reductions of the influence of money in politics that apply across the board and thus avoid the issue of bias. But I don’t see a 2A issue here at all. I know the NRA position is that any law that limits access to guns is an unconstitutional infringement, but my view is based on what Justice Scalia wrote in the Heller decision. Putting aside the lobbying ban, I believe what Ocasio-Cortez is calling for as gun policy is consistent with Scalia’s guidance. You would have a stronger case saying she is opposing the First Amendment than the Second, but that hinges on the notion that “money contributions = speech” where I believe the Supreme Court decision was flawed. I hope not. I like her because she introduces a new element to Congress. I want to have a long conversation with her to pick at her mind. Here’s something you see over and over. Read the thread title. In liberal speak, if one opposes something or someone, one is frightened of them. Liberals think this way because they are basically physical cowards. They associate their politics with fear. That is a common refrain among all stripes. Thank you. Great illustration of how far conservatives are going to build up AOC. She’s as much the CEC’s creation as anything. The mass hysteria/mass obsessive love disorder among many Trump supporters regarding AOC is really something to behold. Keep it guys, you’re only going to make her stronger.